You'll have seen a thousand photographs of the Pyramids of Giza by the time you finally get here, but nothing beats getting up-close-and-personal with these ancient monuments. Egypt's most famed and feted structures, these ancient tombs of kings guarded by the serene Sphinx have wowed spectators for centuries. Today, they continue to work their magic on all who visit. 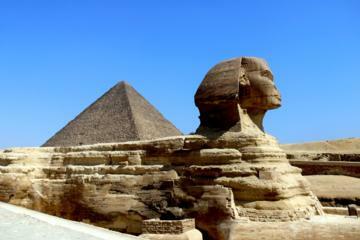 No trip to Egypt is complete without time spent here at one of the world's most recognizable tourist attractions. Towering incongruously over the edge of Cairo's suburban sprawl, these mighty monuments are a tribute to the power and ambition of Egypt's Pharaonic rulers. Giza's Great Pyramid (also called the Pyramid of Cheops) is not only this ancient site's most famous monument but one of the most well-known monuments in the world. It was built by the Pharaoh Khufu (commonly called by its Greek transliteration of Cheops) and was known to the ancient Egyptians as Ekhet Khufu ("Horizon of Khufu"). According to Herodotus, 100,000 men worked on its construction for three months every year. This mammoth structure's cubic content is staggering. Excluding the rock foundation and the interior chambers, the Great Pyramid is 2.3 million cubic meters. The base measurement is 227.5 meters, and the vertical height is 137.2 meters. The non-claustrophobic can venture into the pyramid's bowels, although there isn't much to see once inside the dank, narrow corridors. The entrance is by a passage on the northern side of the pyramid, which was cut by tomb robbers some 15 meters below the original entrance. This narrow tunnel leads into the Grand Gallery, a long passage that is a marvel of skillful masonry. Beyond this is the Tomb Chamber containing the open, empty granite sarcophagus, which once would have contained Khufu's mummy. Excavations on the south and east sides of the Pyramid of Cheops in 1954 brought to light five long cavities for boats, with a Solar Barque broken into more than a thousand pieces as a votive offering. Painstaking restoration work pieced the barque back together, and the 4,500-year-old, cedar-wood boat is now exhibited in this small one-room museum just beside the Great Pyramid. On the eastern side of the Pyramid of Cheops are three smaller pyramids made as tombs for queens and a daughter of the Pharaoh and a large cemetery for other relatives. On the south side is a row of large mastabas belonging to high dignitaries. To the west of the Pyramid of Cheops is the extensive royal cemetery for members of the Royal House and high State officials, established during the fourth Dynasty and used until the sixth. Here, you'll find the small columned-entry of the Tomb of Senegemib-Inti, which contains some interesting wall carvings. The Pyramid of Chephren (Pyramid of Khafre) sits 160 meters to the southwest from the Great Pyramid. Built by Khufu's son Khafre, it at first appears to be larger than his father's earlier pyramid as it stands on a higher piece of land. A considerable section of the original limestone casing has managed to be preserved on the apex of the pyramid, and the layout of the mortuary temple on the east side can be clearly distinguished. The pyramid has a height of 135.5 meters and a base measurement of 210.5 meters. The smallest of the three main Giza pyramids is the Pyramid of Mycerinus (Pyramid of Menkaure), made of unusually large limestone blocks. It has a vertical height of 62 meters and a base measurement of 108 meters. On the south side of the pyramid are three smaller pyramids, left unfinished, for relatives of the Pharaoh. The best panoramic pyramid views of the entire site are on the rocky escarpment four kilometers south of the Pyramid of Mycerinus. Perhaps the most celebrated monument in Egypt after the Great Pyramid itself, the enigmatic Sphinx is a simple but finely built granite structure shaped like a recumbent lion that sits immediately northwest of the Pyramid of Cheops. Hewn from the natural rock, it has the head of a pharaoh (commonly thought to be Chephren) and wears the royal head-cloth and cobra. Weathering and deliberate mutilation have wrought much damage over the course of the centuries, but in spite of this, the Sphinx still conveys a powerful impression of majesty and artistic achievement. The total length of the figure is 73.5 meters, and its height is 20 meters. If you want to horse ride at the pyramids, it is well worth heading to the village stables (by the Sphinx car park), where the guides are recommended and the horses are kept in good conditions. The best time to go for a horse ride in the pyramid area is sunset, when you can head out into the surrounding desert for views of the monuments as the sun sinks. Although it's something of a cliché, a camel ride in front of the pyramids is one of those tick-the-list Egyptian things to do. If you're going to get on a camel once during your trip, it should be here. Unfortunately, many of the camels are not kept in good condition, so it's of the upmost importance that you choose your operator carefully and make sure the camel is healthy and well-fed. The overly aggressive camel touts who hang out on the roadside just before the main entrance ticket office are best avoided. Prepare to bargain. There's an "official" price of EGP 35 per hour, but no one keeps to it, and if you manage to get EGP 50 you should be pleased. The Sound and Light Show at the Giza Pyramids allows you to see these ancient monuments lit up under the night sky with a narrative soundtrack provided by the Sphinx. 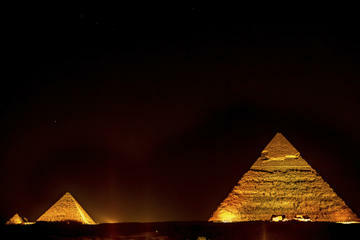 This Pyramids Sound and Light Show tour includes tickets to the show, as well as pickup and drop-off from your Cairo hotel. Built by the rulers of Egypt's Fourth Dynasty (c. 2600-2500) the Pyramids of Giza rank among the oldest surviving man-made structures in the world. During the Greek and Roman eras, they were marveled at as the first of the Seven Wonders of the World, and they still exert a powerful fascination, both as an extraordinary technical achievement and as a demonstration of the power of the pharaohs, who could marshal tens of thousands of subjects to construct these colossal monuments. The question of the relationship between the size of a pyramid and the ruler for whom it was built is still unsettled. It seems probable, however, that the size depended on the pharaoh's personal inclination, power, and economic resources. It has not been possible to prove an alternative theory that the size of a pyramid might be increased in stages in the course of a lengthy reign. Features common to all the pyramids are their situation on the edge of the desert to the west of the Nile and their structure, built up from huge blocks of the local limestone and enclosed in a casing, originally polished, of fine-grained white limestone or granite. Concealed within the great bulk of the pyramid (in the later period) or underground beneath its base (in the earlier period) were the relatively small tomb chamber, a chamber for the cult of the dead pharaoh, and other chambers for the grave goods. Also common to all pyramids were the entrance on the north side and the mortuary temple on the east side, with a causeway (originally open, later frequently covered) leading up to it from a valley temple on the edge of the Nile Depression. Luxury Hotels: Just steps away from the main entrance to the Pyramids, the historic Marriott Mena House, Cairo has hosted royalty and celebrities amid its 40-acre grounds. There an outdoor pool amid sprawling lush gardens, and the interior spaces are scattered with antiques. The Four Seasons Hotel Cairo at the First Residence is on the Nile's west bank. There are five restaurants and lounges, a pool, and holistic spa, and the large rooms are elegantly attired. Mid-Range Hotels: Le Meridien Pyramids Hotel & Spa is less than one kilometer from the Sphinx entrance to the Pyramids complex. The hotel has excellent facilities including comfortable rooms, large outdoor pools, and a stylish spa. Budget Hotels: In the Giza area, with views of the Pyramids from some rooms, Pyramids View Inn has a rooftop with panoramic vistas, a complimentary breakfast, and friendly staff. Anyone with a decent fitness level can easily walk between the pyramids and the Sphinx (as long as it's not too hot), but if you want to go up to the panoramic viewpoint, you'll need transport within the site. The easiest way to do this is to arrange an organized tour of the area, which means you'll have an air-conditioned vehicle at your disposal. A good tour guide can also help you understand the baffling, long history on display here and help you cope with the many camel and souvenir touts, which can make all the difference to enjoying your visit in the desert heat. Full-Day Tour: History lovers will appreciate the Giza Pyramids, Sphinx, Memphis and Saqqara Private Tour, which includes a full day of exploring all the ancient sites in Giza, and beyond to even older Saqqara and Memphis, with an Egyptologist guide. If you want to pack all your pharaonic sightseeing in Cairo into one day, this is an excellent choice, with transport provided from your hotel door. Half-Day Tour: If you want to take your sightseeing at a more mellow pace, the Giza Pyramids and Sphinx Private Tour is a half-day trip of the attractions of the Giza Plateau with an Egyptologist guide. It includes pickup and drop-off from your hotel. Camel or Horse Riding Tour: For views of the Pyramids and desert beyond, this Sunset Camel or Horse Riding Tour is a great option. It includes pickup and drop-off from your Cairo hotel and your choice of either riding a camel or horse in the desert plains surrounding the Pyramids as the sun sets. Timing Your Visit: To escape the crowds and the worst of the desert heat, the earlier you can get here, the better. If you want to enter the interior of the Great Pyramid, also be aware that limited numbers of Great Pyramid entry tickets are sold on a first-come-first-served basis twice a day, at 8am and again at 1pm. Tickets: If you miss out on Great Pyramid interior tickets don't fret. Tickets for the interior of the Pyramid of Chephren are sold throughout the day with no limit on numbers. By Private Taxi: The easiest, and most popular, way of getting here for independent travelers is by hiring a taxi for a half-day trip in Cairo. The taxi can then shuttle you around the site (if you wish) and return you back to the central city afterwards. If you hire a taxi one way, you can find a return taxi to take you back into town by the Sphinx entrance. By Local Transport: You can get to the pyramids using a combination of the Cairo Metro and minibus. Take the metro to Giza and then take a minibus (right outside the Giza metro station exit) or taxi to the pyramids. Around the Pyramids: Be sure to schedule plenty of time into your Egypt itinerary to see some of the countries cities and other wonderful sites. Check out our articles on things to in Cairo, exploring Saqqara, and visiting the attractions of Alexandria. Heading up the Nile: See our articles on Luxor and Aswan if you want to delve into more pharaonic sights. These beautiful cities on the Nile are fun places to explore and packed with incredible sites, including Abu Simbel, easily visited from Aswan.